Still can't believe Landon's last day of school was today! 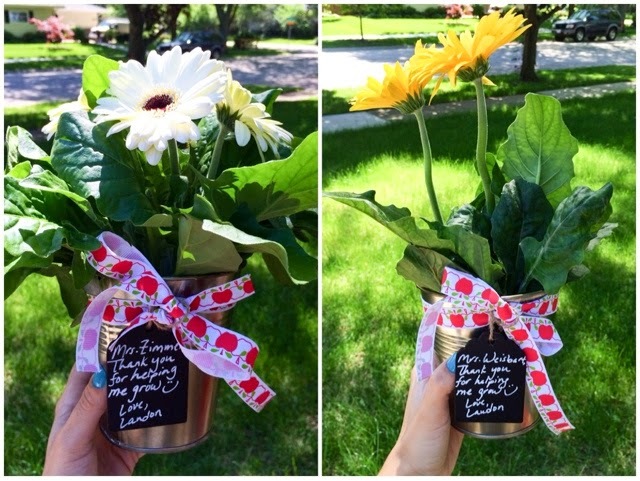 Made these lil planters for his teachers to thank them for all their hard work with him this past year. He has certainly made some enormous strides from when he started back last August and we are so thankful. - chalkboard marker. How I just found out about these chalkboard markers is beyond me. I used to use regular chalk to write little chalkboard signs (here & here) but these markers make it SO much easier, and much prettier. Found mine at Michaels for $12 (4-pk). - Ribbon to prettify and gift-ify your pot and also to secure your chalkboard tag. You will need to tape down in two areas so it doesn't slip down to the bottom of the pot. I found this cute apple ribbon a while back in the clearance bin at Michaels. Any ribbon will work just fine but the thinner actually the easier to work with. Great blog Lisa. I'm going to send you an email this week about a baby topic I'm researching.